Are you Struggling to get a Custom Cut and Bend Angle? At MetalsCut4U you can configure your metal angle (bracket) just the way you need it. Define the length of each leg, define the radius the angle (bracket) should we should bend it to, and define the total length of the angle - all within our easy 4-step process. What is a Custom Cut Angle? An angle is an L-Shaped metal piece. Angles are generally used as a structural element or in repairs and fabrications. This is one of the most used shapes in constructions and furniture. How to configure your custom fabricated metal angle online? you already have fulfilled 3 out of the 4 easy steps to configure your sheet metal angle. In the 4 step you choose the angle to be configured. 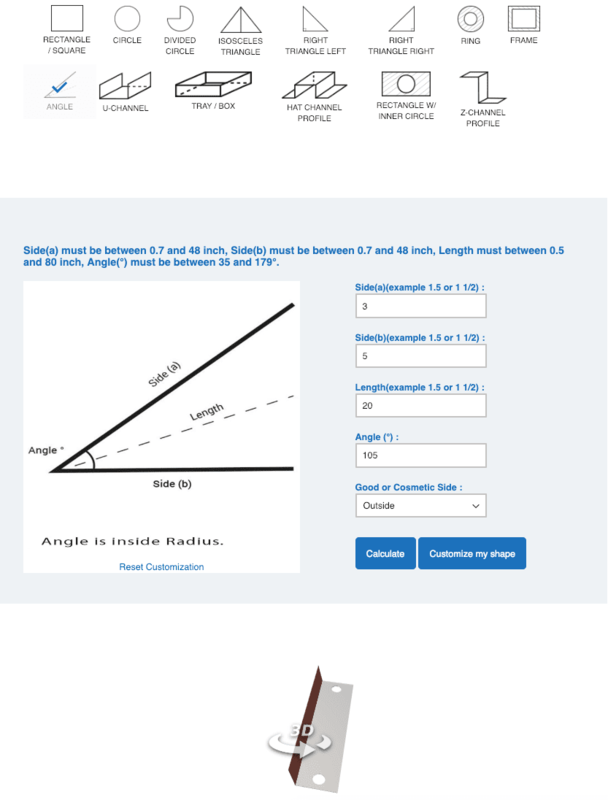 The sheet metal calculator will give you a price for your custom cut metal angle including the options you have chosen. The process of Getting a Custom Cut Angle? Ordering a custom made angle is easy and fast. After selecting the material like aluminum, stainless steel or carbon steel, you will be asked to choose from a variety of finishes and thicknesses, before you are asked to specify every measurement of your angle. 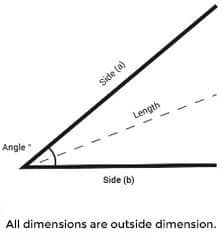 Angles are called differently depending on what they are being used for. An angle can be called a corner guard, because it is used to protect a corner of a wall or door entry.An angle is also called a bracket, where its used to support or attach something. The usage of a metal angle varies from purpose to purpose and industry to industry. Metal anglescan be used as rails, frames, hangers, flanges, stiffeners, bars and many more. It can be custom made out of aluminum, stainless steel or steel. Customize the angle as per your requirement at an affordable price. Corner guards are essential for protecting the walls from cracks and chips especially in high traffic areas, restaurants, airports, new homes and freshly painted walls, etc. Choose the surface type of your corner guard with styles available. MetalsCut4U is happy to assist you in fulfilling your every possible need.